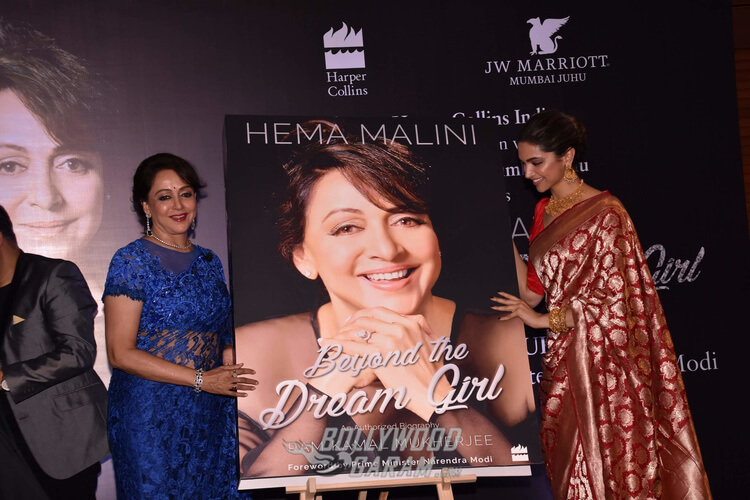 Bollywood’s Dream Girl, Hema Malini’s 69th birthday on October 16, 2017 has helped her embark on a new phase of her life altogether – that of an author who has reflected upon her life journey, her career, marriage and more in her biography – Beyond the Dreamgirl! 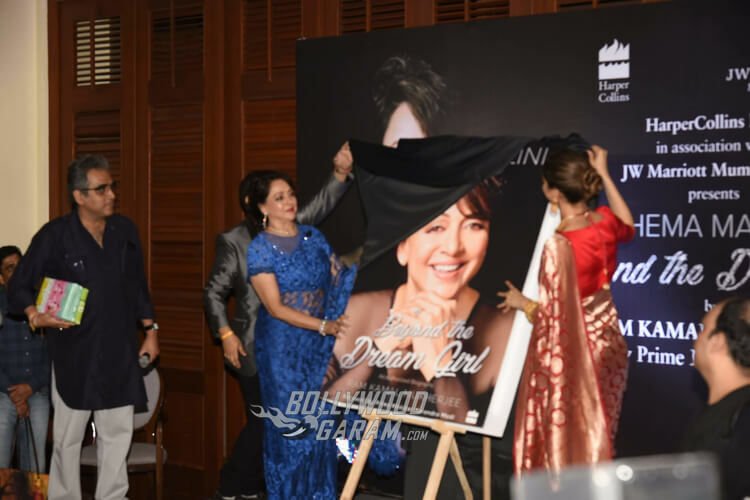 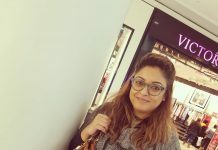 A video that was launched on her book launch included about 50 Bollywood celebrities that she has had associations with since her Bollywood journey began – some of them being Amitabh Bachchan, Ramesh Sippy, Lata Mangeshkar, Neeta Lulla, Shiamak Davar, Kriti Sanon, Arjun Kapoor among others. 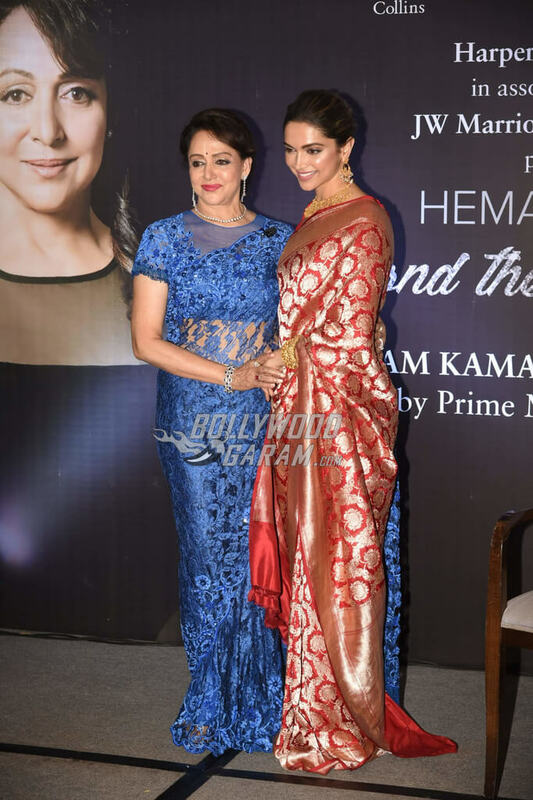 During the book launch on Monday, October 16, 2017, Hema Malini who looked graceful and stunning in a beautiful floral print blue sari was joined by friends, family and Bollywood’s highest paid actress, Deepika Padukone. 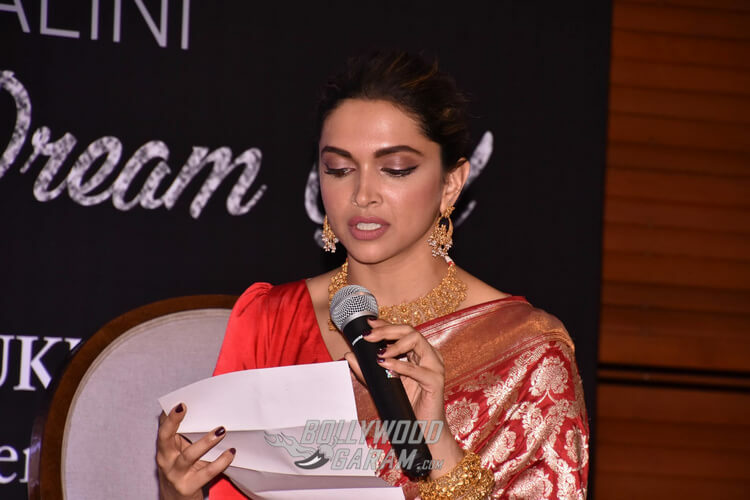 Deepika too looked gorgeous in Sabyasachi’s red banarasi sari with heavy and intricate work all over the sari paired with gold earrings, neckpiece and bangles. 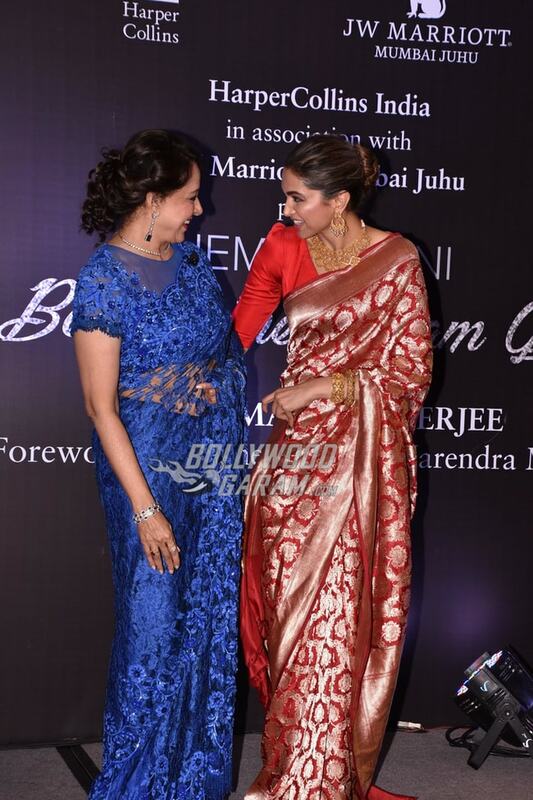 Hema Malini and Deepika were seen chatting with each other and posed candidly for the shutterbugs at the launch event. 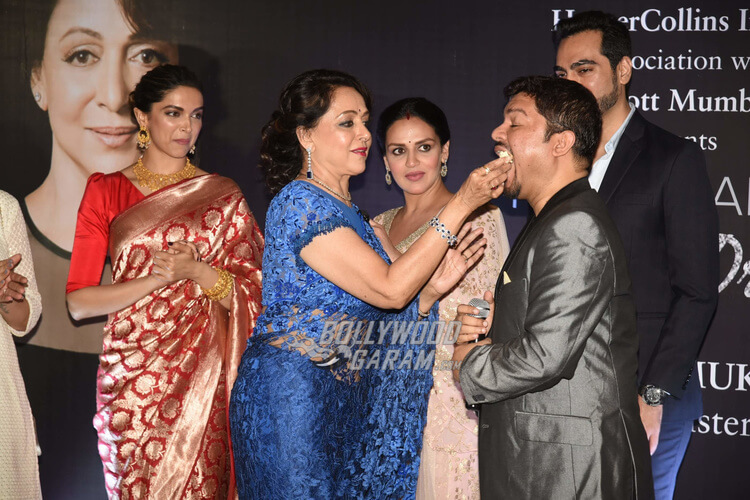 They were joined by Hema’s daughters, Esha and Aahana Deol with their husbands. 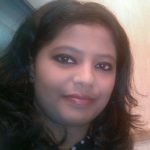 While Esha wore a peach and golden colored suit, Aahana looked pretty in a white traditional wear. 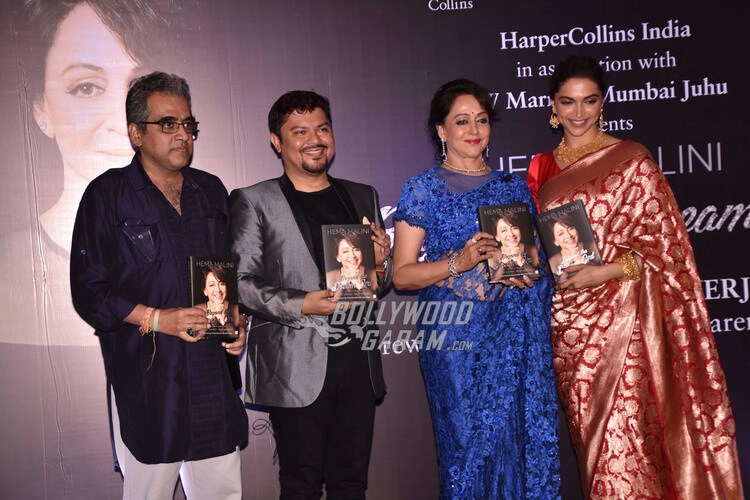 Meanwhile, the book authored by Mukherjee also includes a foreword penned by Prime Minister Narendra Modi and an afterword by Ramesh Sippy, the director of Hema’s big break movie, Sholay. 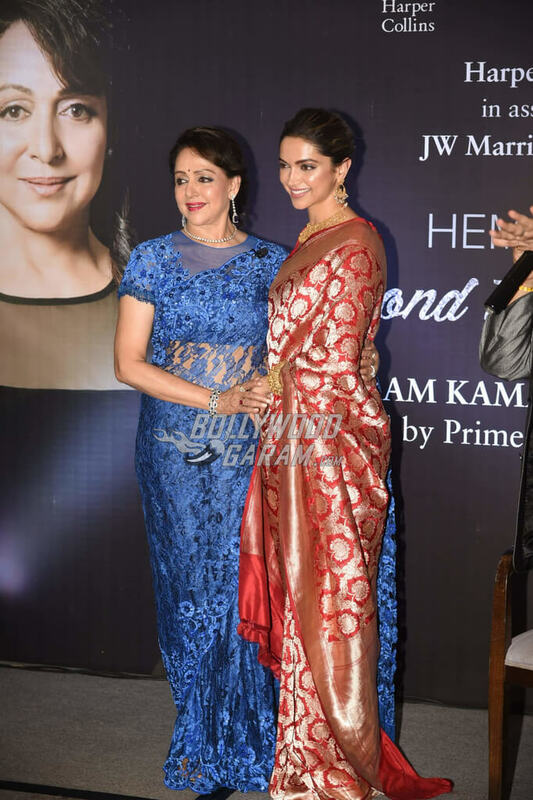 Hema Malini began her career in Bollywood in 1968 with Sapno Ka Saudagar and is known for playing several iconic roles in movies like Satte Pe Satta, Seeta aur Geeta (where she was seen in a double role at a time when Bollywood was essentially male-oriented), Sholay (in the playful role of Basanti), Dream Girl opposite her husband Dharmendra and Baghban at a much later date with Amitabh Bachchan that earned her a lot of praise and appreciation for her role. 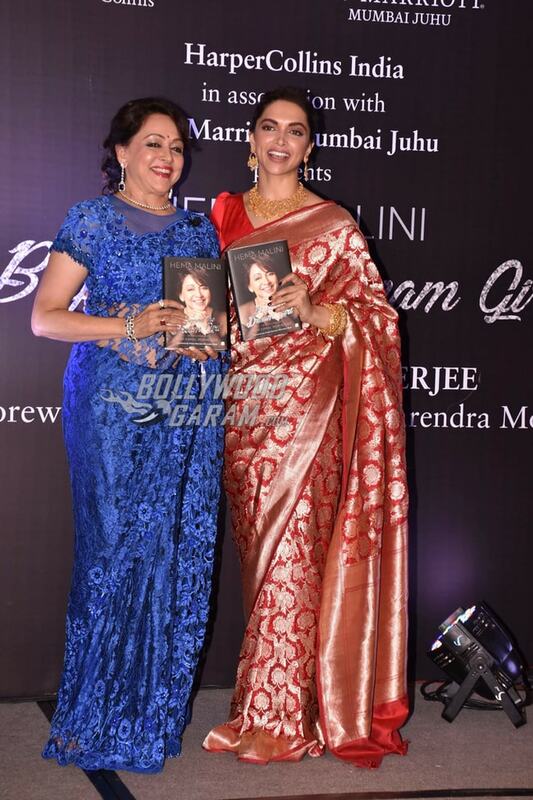 The book reportedly covers 23 chapters that include the various stages of Hema’s life, the impact of Bollywood on her life, films, marriage, colleagues, specific incidents related to films and co-actors, auditioning Shah Rukh Khan for Dil Aashna Hai, her daughters Esha and Aahana, her dance and her political life, giving a glimpse of Hema Malini much beyond the dream girl who was reportedly nominated in Best Female Actor category along with actresses Kajol, Preity Zinta and Rani Mukherji when she made a comeback in Bollywood with Baghban in her late fifties. 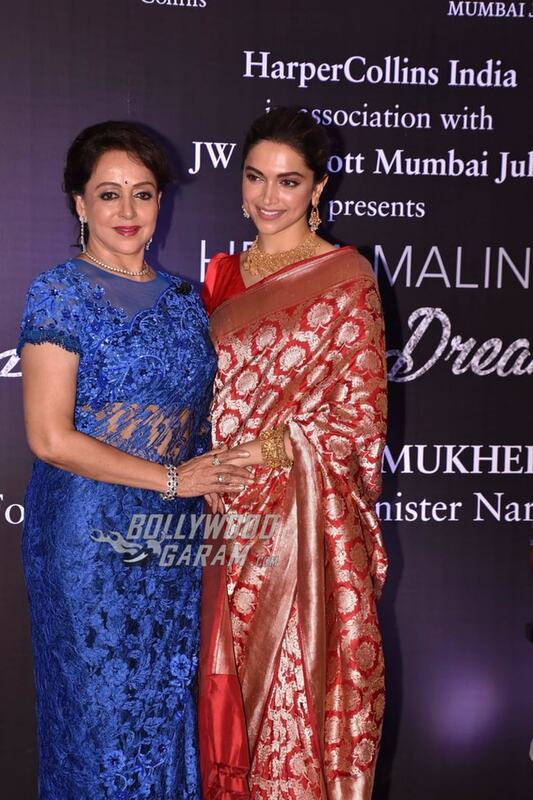 Exclusive photos of Dream girl with Deepika Padukone and her family at the event!